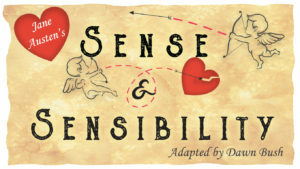 The next production that we are currently working towards is our summer tour of Jane Austen’s ‘Sense & Sensibility’, adapted for stage by Dawn Bush. The Dashwood sisters, Elinor, Marianne, and Margaret, are left at the financial mercy of John, half-brother, and his greedy wife. Elinor (the more practical sister) tentatively allows herself to fall in love with Edward Ferrars, the gentle brother of the girls’ obnoxious sister-in-law. However the romance doesn’t go anywhere and the Dashwood girls move away to their new home, leaving Edward behind.